There is no greater reward than making a difference in the life of a sick child. 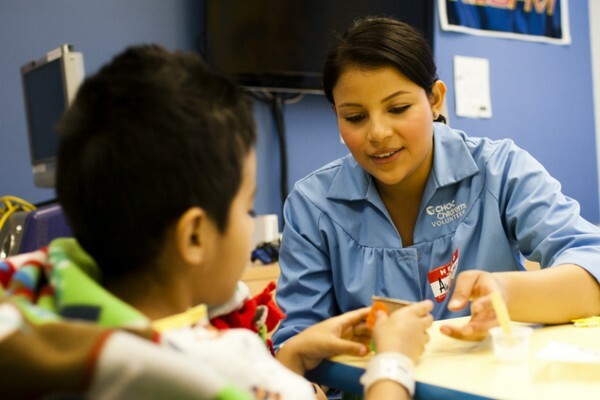 The volunteers at CHOC Children’s generously dedicate their time to help us provide the very best pediatric services in Orange County. For almost 50 years, the volunteer programs at CHOC and CHOC at Mission have provided vital assistance to all hospital departments. We are currently looking for compassionate, enthusiastic individuals who are committed to make a difference in not just their lives, but also the lives around them. For more information on applying to our program, please sign up for one of our information sessions. CHOC assigns volunteer positions based on the current needs of the hospital along with the volunteer’s availability, interests and skill sets. Currently, our highest needs are shifts scheduled Monday-Friday between 8 a.m. to 4 p.m. Night and weekend positions are limited. Detailed information about our volunteer roles is provided at our information sessions. Our volunteer program does not offer job training, internship, practicum or medical shadowing programs. Volunteer services does not offer any type of one-day volunteer opportunities. Anyone interested in coming to visit our patients for one day to host a special event must receive approval by our child life department. Please visit our special visitor guidelines to learn more. We accept pet therapy volunteers applications on an ongoing basis. You must have a dog already certified under Pet Partners (formerly known as The Delta Society). No exceptions. Volunteers interested in our pet therapy program can email us at volunteers@choc.org for more information. Daniel is back at CHOC― this time as a volunteer. I get to entertain kids in the same waiting rooms I used to visit as a patient. As a lead patient hospitality volunteer, Dr. Bruno assists families during the discharge process and ensures they get safely from their hospital room to their car. Brianna started volunteering at CHOC when she was just 16 years old. She thought CHOC would be a worthy place to donate her time.